New policies and products often capture the imagination of advocates but don’t always deliver the promised benefits. That is why it is so important that new ideas be tested rigorously in the real world to judge their merit. The Expanding Prosperity Impact Collaborative (EPIC), an initiative of the Aspen Institute’s Financial Security Program, is a first-of-its-kind, cross-sector effort to shine a light on economic forces that severely impact the financial security of millions of Americans. EPIC deeply investigates one consequential consumer finance issue at a time. EPIC’s first issue is income volatility, which destabilizes the budgets of nearly half of American households. Over the last year, EPIC has synthesized data, polled consumers, surveyed experts, published reports, and convened leaders, all to build a more accurate understanding of how income volatility affects low- and moderate-income families and how best to combat the most destabilizing dimensions of the problem. EPIC’s project on income volatility was built, in part, to create an audience for powerful, emerging research that sought to understand how fluctuating cash flows undermine the overall financial health of Americans. 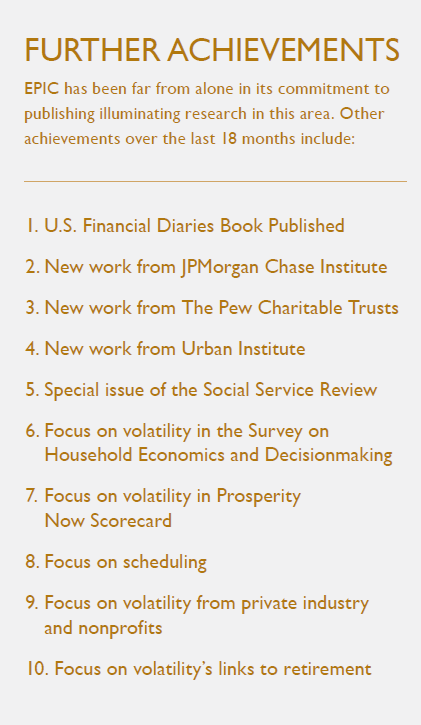 The U.S. Financial Diaries (USFD), JPMorgan Chase Institute, Federal Deposit Insurance Corporation, Urban Institute, Economic Policy Institute, Federal Reserve, Pew Charitable Trusts, Brookings Institution,and scores of academic researchers had all been working on this issue for some time. 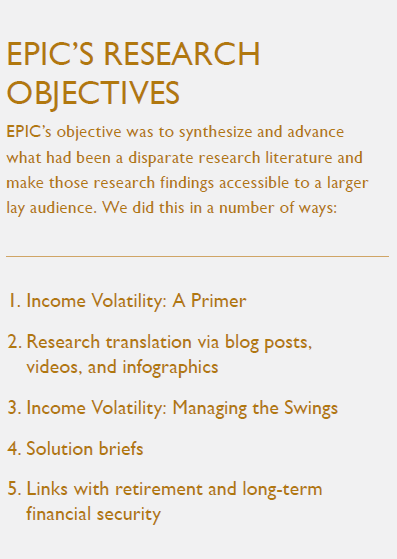 EPIC’s objective was to synthesize and advance what had been a disparate research literature and make those research findings accessible to a larger lay audience. EPIC’s first official publication, this 24-page document distilled decades of academic research on income and, to a lesser extent, expense volatility. Importantly, it distinguished between intra- and inter-year volatility, noting that only recently have researchers focused on the former. Additionally, it identified what researchers had found were the three key causes of income volatility: unstable labor market earnings, unstable non-labor transfers, and unstable household configurations. EPIC wrote about these issues in a special financial security-focused edition of Shelterforce magazine. In order to reach a broader audience, EPIC also created shorter, more digestible content that outlined what we know about the size and scope of the problem. This brief created an intellectual framework for thinking about how institutions like governments, employers, and financial services providers can help families reduce or cope with their volatility. Pulling from academic and policy research, the paper distinguished between reducing volatility at its source – largely through labor market interventions – and mitigating its ill-effects – largely through technology-facilitated cash management strategies. A version of this brief will be published by the Asset Funders Network. Forthcoming EPIC briefs will focus on what we know – and still don’t know – about how volatility in Americans’ working years impede their ability to save for retirement, one of the key ways the middle class has historically built wealth. Over the course of four Delphi surveys, 163 experts gave their views on the prevalence of income volatility, as well as possible trends, causes, and solutions. The experts surveyed came from a broad collection of sectors, including academia, government, and business, and included leaders from some of the largest and most-respected public, private, and nonprofit institutions in the country. The vast majority of respondents voiced serious concern about volatility as both a social and economic problem, though there was disagreement as to where it ranked against other pressing national issues. In the spring of 2016, EPIC polled 1,250 Americans on how concerned they were about volatility and which institutions they wanted to solve the problem. The findings showed large majorities cared deeply about the issue and looked to either the government or employers to help solve it. Commissioned by EPIC and authored by Daniel Schneider and Kristen Harknett, this research brief used qualitative and quantitative methods to make new connections between income swings and family well-being for hourly retail workers. This paper was featured at an EPIC-organized research panel on income volatility at the Association for Public Policy Analysis and Management’s (APPAM) 2017 Fall Research Conference. EPIC partnered with the Center for Social Development at Washington University in St. Louis and the Intuit Tax and Financial Center to reveal new insights about volatility from the biannual Household Financial Survey. The partnership has produced two briefs, one that looks at how the low- and moderate-income survey respondents answered questions about income and expense volatility, and a second, forthcoming brief about how those with volatile incomes tend to answer other questions about financial behavior and economic outcomes. These papers were featured at an EPIC-organized research panel on income volatility at APPAM’s 2017 Fall Research Conference. The multi-year research project referenced above culminated in the publication of The Financial Diaries: How American Families Cope in a World of Uncertainty in early 2017. The book, which was authored by Jonathan Morduch and Rachel Schneider, was officially released at the Aspen Institute’s Summit on Inequality and Opportunity. Among its many findings, the book highlights the importance of cash flow, including income and expense volatility, to the health of families’ finances. While the book is a comprehensive collection of USFD’s findings, researchers Morduch and Julie Siwicki also published a new USFD research paper in 2017 on how families with volatile incomes often suffer from episodic poverty. And Morduch and Schneider also teamed up with Timothy Ogden to publish a brief in 2017 on one particularly extreme example from the research project of living paycheck to paycheck. Since EPIC launched, the JPMorgan Chase Institute has published three major reports on income and expense volatility. The reports’ findings have largely shaped the field, using proprietary transactional data to demonstrate, among other findings, that (1) month-to-month income volatility is quite widespread, even reaching well into the middle class; and (2) expense volatility is even more severe, often triggered by large medical and tax bills. The Pew Charitable Trusts focused specifically on volatility in a May 2017 brief, finding that inter-year volatility – both positive and negative shocks – is associated with lower levels of self-reported financial security. In 2016, researchers from the Urban Institute published a study linking financial instability and volatility to eviction, ability to pay rent or mortgage, ability to pay utility bills, and reliance on public benefits – all of which affect the economic health of the surrounding communities and governments. In September 2017, the University of Chicago published a special edition of its Social Service Review dedicated exclusively to the topic of economic instability. Though using a slightly broader lens than EPIC’s, the issue featured academic work on a number of areas directly relevant to income volatility, including episodic poverty, unpredictable schedules, informal safety nets, public benefit churn, and child health effects. After not asking any questions on volatility in 2014, the Survey on Household Economics and Decisionmaking (SHED) highlighted volatility in its 2015 and 2016 editions. In May 2016, the 2015 survey results were released, finding that widespread income and expense volatility had made it difficult for many to pay their bills. The Fed produced a special video highlighting the volatility findings. In May 2017, the 2016 survey results, which included new questions on the predictability of workers’ schedules, were released. The 2016 survey did not include the previous year’s questions on expense volatility, but we are told those questions will be added back for the 2017 survey. In 2017, Prosperity Now included income volatility in its annual Scorecard for the first time. The Scorecard, a widely distributed tool for advocates, practitioners, and researchers, provides a state-by-state snapshot of how families are managing financially and how government policies are helping or hurting economic stability and mobility. A number of researchers have focused on the prevalence and perils of unpredictable schedules,43 which, perhaps not coincidentally, have also been targeted by recent state and municipal legislation. A number of private companies and nonprofits have also recently recognized the importance of volatility in the lives of their customers and clients. For example, the small-dollar credit provider LendUp has started looking at its own data to explore the way income and expense fluctuations could impact their customers’ ability to repay loans. Additionally, the Family Independence Initiative, a nonprofit focused on reducing poverty, has done a similar analysis. In both cases – as well as in a number of other instances in which companies that wish to remain anonymous have done their own internal research on volatility – EPIC played a critical role nudging would-be researchers to act. In addition to EPIC’s own work in this area, the New School for Social Research and the National Endowment for Financial Education (NEFE) have recently analyzed the Survey of Income and Program Participation (SIPP) and records from the Social Security Administration (SSA) to conclude that income shocks are widespread and closely associated with withdrawals from retirement savings and overall lower balances. Despite the immense progress that has been made, there is still important work to be done. A number of key research questions remain unanswered, and a number of proposed solutions remain untested. Answering these questions and evaluating potential solutions will likely require leveraging new data sources. This section will identify what we view as the most pressing research questions, the most promising solutions to test, and the most revealing data sources, providing the beginning of a roadmap for the field. 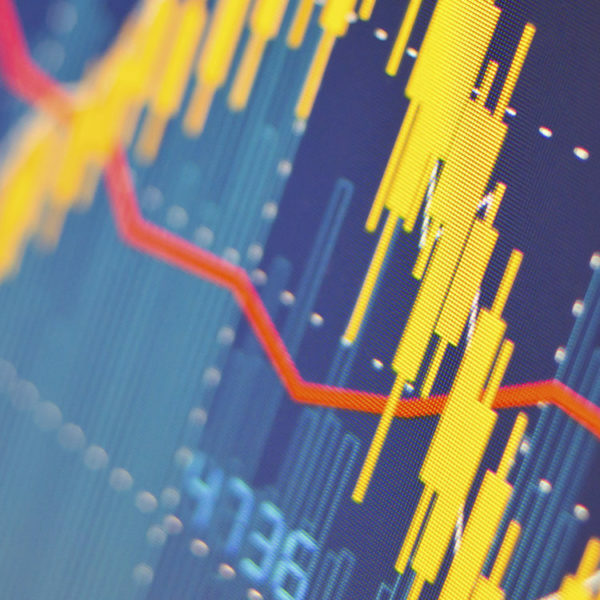 Exactly how do workers experience intra-year volatility? While inter-year volatility has been studied for decades and is easier to see in the data, intra-year, or month-to-month volatility is likely more relevant for addressing Americans’ day-to-day financial challenges. But we simply do not know with much precision which workers are experiencing intra-year volatility and the nature of that volatility. Take, for example, a seasonal worker who experiences huge spikes in income a few months out of the year, and, on the other hand, a retail worker who experiences ups and downs throughout the year. Both experience volatility, but the effect that volatility has on their financial stability, consumption, savings, and wellbeing, and the policies and products that would help address it, would likely be very different. Better understanding of these differences and more detailed knowledge about volatility will help entrepreneurs and legislators better target solutions – and may make it easier to make the case that there is a large market/constituency to be served by addressing the problem. What is the effect of income volatility on public benefit eligibility? As EPIC wrote in its solutions framework, “The mitigation value of traditional safety net programs [like the Supplemental Nutrition Assistance Program (SNAP), Temporary Assistance for Needy Families (TANF), and Medicaid] could be bolstered by designing eligibility criteria and processes cognizant of the incidence of volatility. Depending on the resources and nimbleness of the government agency involved, this can involve making programs more responsive to changes in income, so that benefits flow to those truly in need, even if only for a few weeks, or less responsive, so that short-term swings don’t create unnecessary and administratively burdensome churn in and out of the program.” However, we know very little about how big of a problem this is. How many low-income workers re-certify for means-tested benefits every time their income changes? How stringently are eligibility rules actually enforced on the ground by caseworkers? What, if anything, can the public sector learn from innovative approaches to credit underwriting being undertaken by some fintech startups to more quickly and accurately gauge an applicant’s income and asset holdings? These questions should be a high priority for researchers to tackle. What is the effect of volatility on social networks and, conversely, how can social networks mitigate volatility’s ill-effects? Most studies of income volatility focus on individuals, couples, families, or households as the unit of measurement. However, qualitative research, as well as anecdotal accounts, indicate that (a) volatility can affect a much broader group, and (b) the size and strength of an individual’s social network can go a long way towards softening the blow of volatility. When just one person in a community experiences a drop in income, for example, dozens of people in that person’s kin and social network can be impacted, often negatively. On the other hand, those with strong kin and social networks are more likely to be able to cope with volatility when it inevitably requires the affected individual to juggle work, child care, schooling, and other obligations. Understanding these network effects is critical to understanding the full consequences of volatility. Collecting this information is notoriously difficult – there is a reason that most surveys only ask about the respondent and, in some cases, his or her immediate family. But there are ways that researchers can move beyond the usual way of doing things, including through in-depth interviews or by adding questions to existing surveys about instances when the respondent provided time or money to help friends or family. What is the effect of volatility on children’s development? More and more attention is being paid by researchers to the effect of instability on children’s development. Though instability is usually defined broadly to include much more than just income volatility, some studies do isolate volatility. The challenge, though, is proving a causal connection, as opposed to just a correlation. Correlations, while important, are limited in their usefulness for prescribing particular interventions because they do not tell you which variable is causing which outcome. Proving causation, however, requires experimental or quasi-experimental methods, which are expensive and difficult to implement. Furthermore, studying child development outcomes often requires a longitudinal perspective to see if any effects are lasting. Investigating the ways in which volatility directly impacts children – and better understanding the vectors, whether they be parental stress, substandard housing, or foregone medical care – would be a major breakthrough, likely garnering the attention of federal policymakers. We believe the possibility of improving our understanding in this area justifies the cost of the research. What is the interplay between income and expense volatility? While we attempted to incorporate expense volatility into EPIC’s analysis – and did so on occasion – we were often stymied by a paucity of data. In many ways though, focusing on just income volatility ignores what really matters: families’ ability to purchase or finance critical goods, services, and assets. Research from the JPMorgan Chase Institute has begun to shed light on this issue, but it remains a frontier space for researchers. Better understanding which expenditures are triggering financial insecurity and how volatile and unpredictable those costs are could lead to needed product and policy innovation. Is there a relationship between household volatility and the macro-economy? One way to make the case to policymakers and business leaders that volatility matters is to emphasize the impact it has on the larger economy. Indeed, as we hypothesized in EPIC’s primer, “Volatility that causes financial stress can be a drag on worker productivity, potentially affecting the larger economy. And volatility that fuels consumer debt acquisition and diminishes savings can lead to ‘balance sheet’ recessions such as the one from 2007 to 2009. Families constraining consumption or avoiding risk could impair macroeconomic demand and vitality.” However, very little concrete research backs up these theories. In many ways, this is not surprising. It would be near-impossible to draw a solid, causal line connecting any one household financial activity with macroeconomic performance. But there is progress to be made teasing out the relationships between household level financial stability and macroeconomic stability. For example, the aforementioned Urban Institute study linking financial instability and volatility to the economic health of the surrounding communities and governments was a major contribution to the field. But more can be done to connect the dots. For example, economic modeling based on data and strong theoretical work could inform model development and testing. The International Monetary Fund’s work connecting financial inclusion and household leverage to macroeconomic growth could serve a model in this regard. New policies and products often capture the imagination of advocates but don’t always deliver the promised benefits. That is why it is so important that new ideas be tested rigorously in the real world to judge their merit. This is not an argument for not trying new things – in fact, just the opposite: the more experimentation, and evaluation, the better. A number of jurisdictions are experimenting with different varieties of this policy, presenting a great opportunity for evaluation. How are the new rules being enforced? Are workers happier under a predictable scheduling regime? Are they better able to arrange for child care, take a second job, or invest in their education? Are employers hiring fewer workers, or offering fewer hours, as a result of the law? Are there any other unintended consequences policymakers should be aware of? Volatility research has slowly chipped away at the previously prevailing view that individuals save and consume based on their expected lifetime income. Indeed, research has shown that Americans’ financial lives are much more fluid and multi-faceted than previously appreciated. At the same time, Americans are facing an increasingly complex financial product landscape – a world of adjustable-rate mortgages, individually- managed 401(k)s, and non-dischargeable student loans, among a host of other fine-print-laden offerings. Clearly, low- and moderate-income families – who do not have access to high-priced financial advisors – need help making these high-stakes financial decisions. The old financial education models – focused on didactic, classroom-style learning or last-minute crisis prevention – and the old rules of thumb – around emergency savings, retirement spend-down, and housing costs – are both likely in need of updating. But what will take their place? One area worth further exploration is intensive, individualized, and experiential learning, like that offered by financial coaching. Early evaluations of its efficacy show coaching, when targeted at those motivated to receive it, can work. And some coaching-providers, like The Financial Clinic, have been proactive in incorporating volatility research into their curriculum. Questions remain, however, about scalability, the duration of effect (is coaching like a one-time vaccine, or do clients need “booster shots?”), and the importance of modality (in-person versus remote) and standardization (should there be a universal credentialing system for would-be coaches?). Researchers can also help by building and testing promising, lighter-touch interventions like algorithm-powered budgeting apps and new-age rules of thumb. For example, the app company Cinch Financial is attempting to use big data and machine learning to generate sophisticated and individualized advice for its customers. And the nonprofit Commonwealth has published a how-to guide for designing “simple, actionable guidelines that can help consumers with financial decision-making.” An early success from Commonwealth’s work was an evaluation that found two rules of thumb for credit card revolvers were moderately effective at reducing debt. There may be other opportunities for large-scale experiments as well: whenever an employer rolls out new benefits, for example. By delaying the phase-in for a randomized group of workers, the company can create the necessary conditions for a randomized control trial. Thus researchers and employers should look for opportunities to work together in this way. Other than the JPMorgan Chase Institute’s groundbreaking analysis of proprietary transactional data, no other studies have used administrative data to look at month-to-month volatility. Administrative data, which can come from both government or private sector sources, is superior to survey data because survey respondents are notoriously unreliable at precisely reporting income. Additionally, administrative data on intra-year volatility can help definitively answer questions that surveys have failed to resolve. For example, some – but not all – surveys find race, ethnicity, and income level to be major predictors of volatility. Also, a disproportionate amount of the volatility research to date has focused on the retail sector, which makes sense given the size of that industry and the prevalence of unstable work arrangements there. But focusing heavily on just one sector risks ignoring other problem areas. Internal Revenue Service/Health and Human Services Department records on in-year changes to income or family size for purposes of the premium tax credit in the Affordable Care Act (ACA). Since the ACA Marketplaces launched in late 2013, the government has been requiring Americans interested in purchasing subsidized private insurance to project their upcoming annual income and to immediately report any changes to that projection over the course of the year. Studying the results from this process could help reveal (1) the viability of delivering public benefits through prospectively-calculated tax credits; and (2) the extent of large month-to-month variation in Americans’ income. Some state governments also require Medicaid and TANF recipients to continuously update their income information to ensure continued eligibility for the benefits.60 Though these records would only capture information on those Americans receiving public benefits, they could be instructive, both in terms of describing the extent of volatility as well as the effectiveness of the programs themselves. Child support orders in the US are based in part on the income of the absent parent. As income changes, the child support payer is supposed to report the change so that the payment amount can be revised accordingly. Though not all child support payers report all income changes – and there is a perverse incentive to over-report income losses and under-report income gains to minimize child support liability – with a large enough data set, researchers may be able to control for these inconsistencies. Companies like Kronos, Workjam, Dayforce, and other worker scheduling companies likely have access to their clients’ workforce management data. If anonymized and properly protected, these data could tell us more than we currently know about exactly how volatile workers’ hours really are, how that volatility changes by industry, and how much advance notice workers are currently receiving about schedule changes. Both large (ADP, Paychex) and small (Gusto, Payable) payroll companies have unique access to wage data that would reveal a lot about fluctuations, not just in weekly pay, but also in retirement and health insurance contributions and tax withholding. A new report from the Commission on Evidence- Based Policymaking recommends the federal government invest more in administrative data collection and data sharing. As described in an analysis from the Washington Center on Equitable Growth, adopting the Commission’s recommendations, which would take congressional action, would go a long way to improving the robustness of economic research across the board. In addition to privacy concerns, some of the private sector’s hesitation about sharing data with researchers is that the results of the research may not reflect well on the company or the effectiveness of its products. One way to counteract this understandable concern would be to compensate companies for taking on this risk or guarantee complete company anonymity, perhaps through an encrypted third-party data-sharing platform. Administrative data is not a panacea. One complicating factor is that not all volatility is unplanned or unwanted. Some workers, for example, may want their income to spike during the spring so that they can take off the summer. Of course, the value of volatility is in the eye of the beholder – an inherently subjective measure that administrative data cannot capture. So, to the extent possible, new administrative-based research on volatility should link to qualitative data. Help researchers reach a wider audience by allowing them to tell a richer, contextualized, and more compelling story than what is delivered through just statistics; and 4. Open the door to more volatility research from – and cross-disciplinary collaborations across – a wider range of academics, including ethnographers, geographers, and sociologists. Another way to paint a more holistic picture of Americans’ experience with volatility is through surveys. This can be done via linked datasets, like the pairing of SIPP and SSA records that NEFE and the New School used in their analysis of volatility’s effect on retirement (see “Focus on volatility’s links to retirement” above). Or the way the Center for Social Development links tax data with post-filing surveys (see “Income volatility in the Household Financial Survey” above). The SHED questions on volatility are illuminating, but to get even deeper insights, the survey could ask respondents to (a) rank the causes of volatility, both income and expense, rather than selecting all that apply; and (b) consider other potential consequences to volatility, not just missing bill payments, such as food insecurity and lost housing. Researchers should consider how best to incorporate volatility into existing measures of poverty. The Census Bureau produces an official poverty estimate, as well as a Supplemental Poverty Measure, each year based on annual income findings. But what about episodic poverty throughout the year? No authoritative estimate is made on that question, though it would provide an important new data point in the public’s understanding of Americans’ financial position. With a few tweaks, the Consumer Expenditure Survey (CEX) could be highly valuable to expense volatility researchers. Today, it is a useful tool for understanding general trends in Americans’ spending habits, but could be significantly improved by following the same families for longer periods (instead of just one year, as is current practice) and collecting more granular information on spending categories and timing (the CEX does currently have a detailed “diary” component, but families only keep the diary for two weeks). One example of promising innovation in this space is the New York City Longitudinal Survey of Wellbeing (NYC-LSW), a joint project between the Robin Hood Foundation and Columbia University’s Population Research Center. The large, representative panel is polled every three months on various measures of well-being, including changes in household configuration, gains and losses of jobs, unexpected major expenses, and large gains or losses in income. Though not quite as high-frequency as some macroeconomic data, surveys like the NYC LSW are a model for how we can better understand the fluidity of household finances. Financial security researchers should be proud of the literature they have built around income and expense volatility over the last few years. Thanks to in-depth qualitative interviews, administrative and transactional data analysis, and government, nonprofit, and university surveys, we know more now about the destabilizing effect of cash flow fluctuations than we ever have before. This progress is real and has led to some much-deserved focus on the issue from thought leaders and policymakers. Openness from policymakers and administrators to independent, third-party evaluation. The results of the research must also be circulated – and translated for a lay audience – as widely as possible. Data visualization and other display tools that leverage the power of story- telling can help researchers reach a broad audience. Given the immense scale of the problem, ensuring that knowledge about its sources, effects, and solutions are transmitted widely will be critical. Our hope is that producing this new research will help build the consensus necessary to make real change in industry practice and government policy, and, ultimately, improve the lives of millions of Americans. The authors would like to thank their colleague Katherine Lucas McKay for reviewing a draft of the memo and making invaluable suggestions; Sheida Elmi, Kristen Harknett, Clint Key, Tim Ogden, Caroline Ratcliffe, Daniel Schneider, and Brett Theodos for the time and wisdom they shared on the topic; Balkissa Jacobs for help with citations; and Genee Presta for laying out the memo. 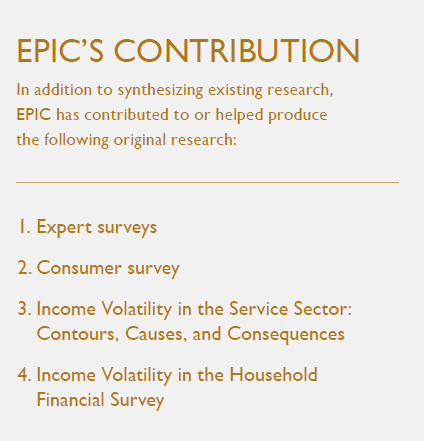 EPIC would also like to thank all those who completed the expert surveys or participated in EPIC’s many volatility-focused convenings. The authors also benefited from the discussions in the volatility-related panels at this year’s APPAM Fall Research Conference. While this document draws on insights shared at these EPIC and APPAM forums and by the aforementioned individuals, the findings, interpretations, and\ conclusions expressed in this report – as well as any errors – are EPIC’s alone and do not necessarily represent the view of EPIC’s funders or Advisory Group members. Finally, EPIC thanks all of its funders for their generous support. For more information about EPIC and our supporters, please visit www.aspenEPIC.org.